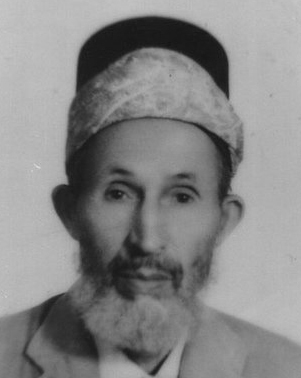 Abd al-Rahman al-Shaghouri (Homs 1912 – Damascus 2004) was a Syrian Sufi master of the Hashimi-Darqawi branch of the Shadhili tariqa, as well as poet, textile worker, and trade unionist. Born in Homs in 1912, al-Shaghouri was soon orphaned and moved to Damascus with his brother. As a child, he worked as an errand boy and later as a weaver. He attended the lessons of the major scholars of Damascus: Husni al-Baghghal, Muhammad Barakat, 'Ali al-Daqar, Ismail al-Tibi, and Lutfi al-Hanafi. However, his most important teacher was Muhammad al-Hashimi, an Algerian Sufi from Tlemcen who had already been living in Syria for twenty years before becoming the representative of Shaykh Ahmad al-Alawi, spiritual master of the Shadhili tariqa. Al-Shaghouri himself met al-Alawi in 1932 in Damascus, but it was al-Hashimi who served as his spiritual guide. Finding that al-Shaghouri was already suitable, al-Hashimi placed him in a spiritual retreat. On the first day, al-Shaghouri pledged himself to al-Hashimi's guidance, an unusual if not unprecedented occurrence in Sufi instruction and discipleship. He never stopped teaching. He once entered the head office of a small religious academy in Damascus with a group of his students and sat down to talk to the director, who bade him wait until he finished some things that were apparently urgent. One thing seemed to lead to another, and the phone kept ringing. Sheikh ‘Abd al-Rahman waited patiently, while his disciples, as the minutes drew on, became less and less so. Finally, the principal of the school set aside his work, looked up at the sheikh and apologized with a smile, and put himself at the sheikh’s service. The sheikh thanked him, asked him how he was, and then said, “I just wanted to make a phone call.” After a short call, he got up, thanked the principal, and left with his disciples. They had needed a lesson in patience and manners, and the sheikh had given them one. Despite his later physical weakness, he never stopped receiving visitors or attending the weekly hadra at the Nur al-Din al-Shahid mosque, in the old quarter of Damascus. He died on 8 June 2004. A great crowd gathered to attend his funeral at the mosque dedicated to Shaykh Muhy al-Din Ibn al-Arabi. The funeral prayer was led by Habib Ali al-Jifri, from Yemen, a well-known representative of traditional scholarship and Sufism in Arab media. His death was widely mourned by scholars and laymen alike, and he was widely recognized as one of the most important revivers of the Shadhili tariqa and Sufism in general, particularly in Syria. His legacy and renown has also become widespread (particularly in the English-speaking world) through two American students whom he authorized in the Shadhili tariqa, Nuh Ha Mim Keller and Zaid Shakir. Al-hada’iq al-nadiyya fī al-nasamat al-ruhiyya ("The Dewy Gardens in the Spiritual Breezes"), Damascus, Dār fajr al-‘urūba, 2nd ed., 1998.